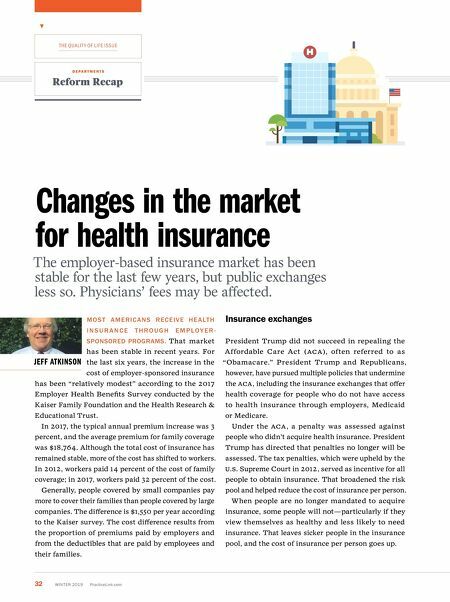 PracticeLink.com W INTER 2019 33 R E F O R M R E C A P Increases in premiums Health care premiums for policies on the exchanges are increasing. The Congressional Budget Office estimates average increases of 15 percent for 2019, and a Kaiser Foundation survey shows increases in a range of 7 to 36 percent, depending on the market. Under the ACA , persons with i ncome of less than 400 percent of the pover ty level were partially protected from increases in the cost of hea lt h i n s u r a n c e b y subsidies to help pay for insurance. (In 2018, 400 percent of the federal poverty level for a family of four in the 48 contiguous states was $100,400.) Many Republicans would like to eliminate or reduce subsidies. If that were to happen, insurance would become more unaffordable for persons with moderate to middle income, and the number of people without insurance likely would increase. 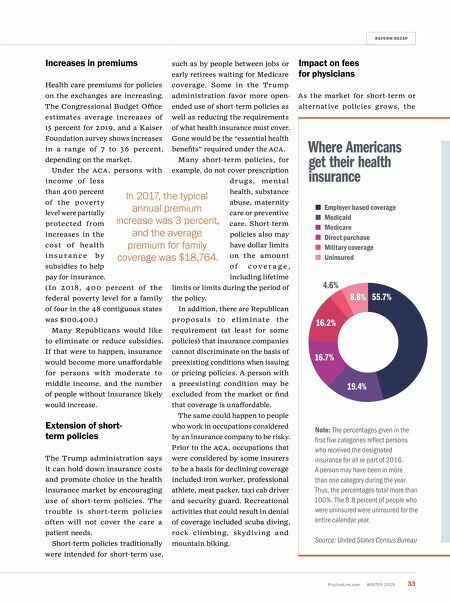 Extension of short ‑ term policies The Trump administration says it can hold down insurance costs and promote choice in the health insurance market by encouraging use of short-term policies. The trouble is short-term policies often will not cover the care a patient needs. Short-term policies traditionally were intended for short-term use, such as by people between jobs or early retirees waiting for Medicare coverage. Some in the Trump administration favor more open- ended use of short-term policies as well as reducing the requirements of what health insurance must cover. Gone would be the "essential health benefits" required under the ACA. Many short-term policies, for example, do not cover prescription d r u g s , m e nt a l health, substance abuse, maternity care or preventive care. Short-term policies also may have dollar limits on the a mou nt o f c o v e r a g e , including lifetime limits or limits during the period of the policy. In addition, there are Republican p r o p o s a l s to e l i m i n a t e t h e requirement (at least for some policies) that insurance companies cannot discriminate on the basis of preexisting conditions when issuing or pricing policies. A person with a preexisting condition may be excluded from the market or find that coverage is unaffordable. The same could happen to people who work in occupations considered by an insurance company to be risky. Prior to the ACA, occupations that were considered by some insurers to be a basis for declining coverage included iron worker, professional athlete, meat packer, taxi cab driver and security guard. Recreational activities that could result in denial of coverage included scuba diving, rock climbing, skydiv ing and mountain biking. Impact on fees for physicians As the market for short-term or alternative policies grows, the Where a mericans get their health insurance Employer based coverage Medicaid Medicare Direct purchase Military coverage Uninsured Note: The percentages given in the first five categories reflect persons who received the designated insurance for all or part of 2016. A person may have been in more than one category during the year. Thus, the percentages total more than 100%. The 8.8 percent of people who were uninsured were uninsured for the entire calendar year. Source: United States Census Bureau 55.7% 19.4% 16.7% 16.2% 8.8% 4.6% i n 2017, the typical annual premium increase was 3 percent, and the average premium for family coverage was $18,764.